Check you local rules of court for variations to these guidelines. The name of the plaintiff or plaintiffs. These are the folk doing the suing. 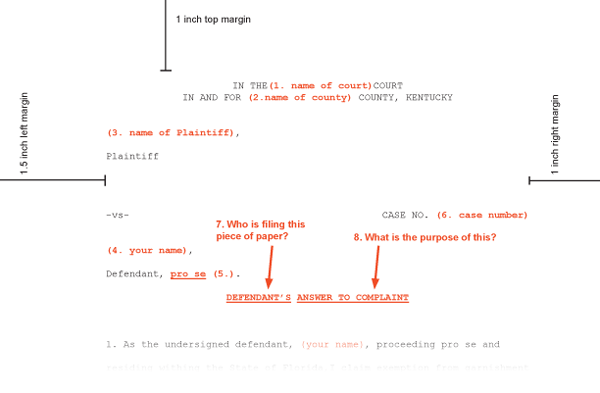 Your name as defendant, who is being sued. “Pro se” means you don’t have a lawyer and you are representing yourself. This is not needed if you have a lawyer; but if you have a lawyer you you would not be devising your own case caption. The case, cause or docket number. Get it right. Who if filing this piece of paper. In this example it is you, the defendant. What is this piece of paper? In this example, it is an answer to a complaint. There are many other types of paperwork, motions or pleadings. NOTE: The sample caption shown above uses red to highlight the different important parts of the caption. In a real pleading, use black print only. Points 1 and 2 in my sample caption cover the complete “name of the court” in Rule 10.01. The “style of the action” in Rule 10.01 means, basically, the names of the parties: Example: John Jones, Plaintiff vs. Jimmy Smith, Defendant. This would be points 3, 4 and 5 in my sample caption. The “file number” is the case number of point 6. A“designation as in Rule 7.01″ mentioned in Rule 10.01 means a “Complaint.” Answer to Complaint,” “Counterclaim” etc., or the type of pleading, which are points 7 and 8, above. Occasionally judges and courts take action without being asked to do so, and there are several specific instances when law and practice require a court to act ‘on its own motion’. However, in the normal course of civil litigation, the litigants and their lawyers have the duty to move a case through its various stages to completion. Quite a bit of activity occurs outside the court house through communication, cooperation, negotiation and agreement between the lawyers representing the various parties. But, when disagreements arise or when the spirit of professional courtesy is lacking, the parties petition the court to make a decision. In Kentucky practice, a litigant’s request to the court for permission, decision or compulsion is generally called a ‘motion’. There are dozens upon dozens of different types of motions that can be submitted to a court. Motions can be made before trial in writing and motions may be made orally in open court, on the record, during the course of trials and hearings. The more serious types of pre-trial motions; such as motions to dismiss a case, motions for judgment on the pleadings and motions for summary judgment; are assumed to be contested. For these types of motions the applicable rules of procedure and practice generally provide for each party to prepare written briefs with time to answer and further time to respond to the answer before the matter is submitted to the court for a ruling. The lesser motions that come before a court are handled more routinely, while allowing for another party to fight the motion if doing so is in his or her interest. In Kentucky practice, these more routine motions are automatically docketed, or put upon a court’s schedule, for the next upcoming Motion Day. “(1) Each circuit and district court shall establish by rule regular motion days as required by statute, and a copy of the rules shall be certified to the Supreme Court as provided in SCR 1.040(3)(a). Kentucky has fifty-seven circuit court judicial districts and sixty district court judicial districts. Each of these one hundred seventeen judicial districts adopt their own respective local rules of procedure on a wide variety of matters. Specifically, pursuant to KRCP Rule 78, supra, there are one hundred seventeen local variations on Motion Day practice. I have yet to find the individual who has read and compared each of these various local Motion Day rules. Punts the motion to the next motion day. There are many ways the parties or attorneys can avoid the necessity of appearing in person in court on motion day. The non-moving party can simply agree to the motion without objection, for example. Or, the parties might agree that the motion be submitted to the court for decision upon written briefs and stipulated facts. The system works better with civil communication and cooperation among the litigants and the court. The main proviso is that all communications to the court must be in writing with copies served upon each of the other parties, or in open court and on the record. Court, after all, is a very formal arena. KRS §427.010 Exempt personal property and disposable earnings of individual debtors. KRS §427.020 Appraisement of defendant’s property — Selection by defendant. KRS §427.030 Debtor’s tools exempt. KRS §427.040 Professional libraries and vehicle exempt. KRS §427.045 Exemptions not applicable to claims for child support. KRS §427.050 Out-of-state law applicable when wages earned and payable out-of-state — Exceptions. KRS §427.060 Homestead and burial plot exemptions — Exceptions. KRS §427.070 Right of spouse and children to homestead. KRS §427.080 Valuation and allotment of homestead exemption. KRS §427.090 Payment of money in lieu of homestead exemption. KRS §427.110 Insurance benefits — Exemptions. KRS §427.120 Police and firefighters’ pension fund in cities of the first, second, and third classes — Exempt from process in some cases. KRS §427.125 Police and firefighters’ pension fund in cities of fourth class — Exempt from process in some cases. KRS §427.130 Salaries of public officials and employees and sums due from governmental agencies are subject to attachment or garnishment — Service of process. KRS §427.140 Employee may not be discharged for garnishment for one (1) indebtedness. KRS §427.150 Property totally or partially exempt. KRS §427.160 Additional general exemption. KRS §427.170 Federal bankruptcy code exemptions applicable in Kentucky. KRS §427.180 Grain storage receipt or scale ticket as prima facie claim of right to possession. Minimum charge for negotiated bank loan. KRS § 360.010(1)(b) at any rate on money due or to become due upon any contract or other obligation in writing where the original principal amount is in excess of fifteen thousand dollars ($15,000); and any such party or parties, and any party or parties who may assume or guarantee any such contract or obligation, shall be bound for such rate of interest as is expressed in any such contract, obligation, assumption, or guaranty, and no law of this state prescribing or limiting interest rates shall apply to any such agreement or to any charges which pertain thereto or in connection therewith; provided, however, nothing herein contained shall be construed to amend, repeal, or abrogate any other law of this state pertaining to any particular types of transactions for which the maximum rate of interest is specifically prescribed or provided. KRS § 360.010(2) Any state or national bank may charge ten dollars ($10) for any loan negotiated at the bank in this state, even if the legal interest does not amount to that sum. Partial payment applied first to interest. KRS § 360.020(1) The taking, receiving, reserving, or charging a rate of interest greater than is allowed by KRS 360.010, when knowingly done, shall be deemed a forfeiture of the entire interest which the note, bill, or other evidence of debt carries with it, or which has been agreed to be paid thereon. In case the greater rate of interest has been paid, the person by whom it has been paid, or his legal representatives, may recover, in an action in the nature of an action of debt, twice the amount of the interest thus paid from the creditors taking or receiving the same: provided, that such action is commenced within two (2) years from the time the usurious transaction occurred. KRS § 360.020(2) Partial payment on a debt bearing interest shall be first applied to the interest then due. Other laws not affected by KRS 360.010, 360.020, or 360.990. Nothing contained in KRS 360.010, 360.020, or 360.990 shall be construed to amend, repeal, or abrogate any other law of this state pertaining to any particular types of transactions for which exemptions, pleading of defenses is denied, or the maximum rate of interest is specifically prescribed or provided. Excess rate of interest prohibited as defense of corporation.KRS § 360.025(1) No corporation shall hereafter plead or set up the taking of more than the legal rate of interest, as a defense to any action brought against it to recover damages on, or enforce payment of, or other remedy on, any mortgage, bond, note or other obligation, executed or assumed by such corporation: provided, that this section shall not apply to any action which is now pending or to any suit or action instituted subsequent to June 16, 1960, upon any mortgage, bond, note or other obligation executed or assumed by such corporation prior to June 16, 1960. KRS § 360.025(2) The provisions of subsection (1) of this section shall not apply to a corporation, the principal asset of which shall be the ownership of a one (1) or two (2) family dwelling. Excess rate of interest prohibited as defense of limited partnership, limited liability company, or business trust.KRS § 360.027(1) No limited partnership, limited liability company, or business trust shall hereafter plead or set up the taking of more than the legal rate of interest, as a defense to any action brought against it to recover damages on, or enforce payment of, or other remedy on, any mortgage, bond, note or other obligation, executed or assumed by such limited partnership, limited liability, or business trust; provided, that this section shall not apply to any action instituted subsequent to June 16, 1972, upon any mortgage, bond, note or other obligation executed or assumed by such limited partnership or business trust prior to June 16, 1972. KRS § 360.027(2) The provisions of subsection (1) of this section shall not apply to a limited partnership, limited liability company, or business trust, the principal asset of which shall be the ownership of a one (1) or two (2) family dwelling. Premiums on insurance to secure loan not considered as interest.Where an insurance company, as a condition for a secured loan, requires the borrower to insure his life or the life of another, or his property, with the company, and to assign the policy of insurance to the company as security for the loan and agree to pay the premiums thereon during the continuance of the loan, and the premiums charged do not exceed those charged for similar policies to persons who do not obtain loans, the premiums in any such case shall not be considered as interest on the loan, and the loan shall not be rendered usurious by reason of any such requirement. Interest on judgment.A judgment shall bear twelve percent (12%) interest compounded annually from its date. A judgment may be for the principal and accrued interest; but if rendered for accruing interest on a written obligation, it shall bear interest in accordance with the instrument reporting such accruals, whether higher or lower than twelve percent (12%). Provided, that when a claim for unliquidated damages is reduced to judgment, such judgment may bear less interest than twelve percent (12%) if the court rendering such judgment, after a hearing on that question, is satisfied that the rate of interest should be less than twelve percent (12%). All interested parties must have due notice of said hearing. Presumption as to interest on foreign debt or judgment.Any indebtedness incurred or judgment rendered out of this state is presumed to bear interest in accordance with the provisions of KRS 360.040. Interest on holdbacks or reserves by persons financing loans on personal property – Reports to dealers.KRS § 360.060(1) Each person engaged in the business of financing loans on personal property sold by dealers to purchasers on credit shall pay interest at the rate of two and one-half percent (2.5%) per annum on holdbacks, reserves or other money withheld from the dealer under any contract for financing such a purchase on credit. Interest on such money withheld shall be paid to each dealer on January 1 and July 1 of each year. KRS § 360.060(2) Any amount withheld by a person engaged in making such loans shall be due immediately upon the close of the loan account. KRS § 360.060(3) Each person engaged in making such loans shall furnish each dealer as of January 1 and July 1 of each year, a report showing the status of the dealer’s reserve or holdback account, if any. Rates of exchange for commercial paper, how fixed.Once in each month or oftener, each bank and each institution authorized to deal in bills of exchange shall fix the rates of exchange at which bills shall be purchased and enter them upon the proceedings of the board of directors, designating the difference to be made, if any, on account of the time the bill has to run. A copy of the rates shall be posted in some conspicuous place in the public room of the bank or institution. If the rates of exchange are fixed by a branch of the bank or institution, they shall not be entered on its records or acted upon by it until corrected, if necessary, and approved by the principal bank or institution. Any alteration made in the rates of exchange shall, before it is acted upon, be noted on the copy posted in the public room. All officers of any such bank or institution shall conform to its rates of exchange so fixed. Rates of exchange to be transmitted to Governor.Each bank and each institution authorized to deal in bills of exchange shall, each month, transmit copies of its rates of exchange to the Governor for his information and for the information of the General Assembly. KRS § 360.100(1)(a)5b. The total points and fees payable by the borrower at or before the loan closing exceed the greater of three thousand dollars ($3,000) or six percent (6%) of the total loan amount as shown as the amount financed on the final Truth-in-Lending Statement. KRS § 360.100(1)(b) “Lender” means any person who funds or negotiates the terms of a high-cost home loan or acts as a mortgage broker or lender, finance company, or retail installment seller with respect to a high-cost home loan. However, any person who purchases or is otherwise assigned a high-cost home loan shall be subject to an action for violation of this section only if the violation for which the action or proceeding is brought is apparent on the face of the disclosure or the underlying promissory note. KRS § 360.100(1)(c)5. A change regarding the requirement or payment, or both, of private mortgage insurance. KRS § 360.100(1)(d)1h. Closing agent fees charged by a third party, but only if the lender requires the particular services for which the borrower is charged and the lender requires the imposition of the charge or the lender retains a portion of the charge. KRS § 360.100(1)(d)2e. Amounts required to be paid into escrow or trustee accounts if the amounts would not otherwise be included in the finance charge. IF YOU OBTAIN THIS LOAN, THE LENDER WILL HAVE A MORTGAGE ON YOUR HOME. YOU COULD LOSE YOUR HOME AND ANY MONEY YOU PUT INTO IT IF YOU DO NOT MEET YOUR OBLIGATIONS UNDER THE LOAN. MORTGAGE LOAN RATES AND CLOSING COSTS AND FEES VARY BASED ON MANY FACTORS, INCLUDING YOUR PARTICULAR CREDIT AND FINANCIAL CIRCUMSTANCES, YOUR EMPLOYMENT HISTORY, THE LOAN-TO-VALUE REQUESTED AND THE TYPE OF PROPERTY THAT WILL SECURE YOUR LOAN. THE LOAN RATE AND FEES COULD ALSO VARY BASED ON WHICH LENDER OR BROKER YOU SELECT. YOU SHOULD SHOP AROUND AND COMPARE LOAN RATES AND FEES. YOU SHOULD ALSO CONSIDER CONSULTING A QUALIFIED INDEPENDENT CREDIT COUNSELOR OR OTHER EXPERIENCED FINANCIAL ADVISOR REGARDING THE RATE, FEES, AND PROVISIONS OF THIS MORTGAGE LOAN BEFORE YOU PROCEED. YOU SHOULD CONTACT THE UNITED STATES DEPARTMENT OF HOUSING AND URBAN DEVELOPMENT FOR A LIST OF CREDIT COUNSELORS AVAILABLE IN YOUR AREA. YOU ARE NOT REQUIRED TO COMPLETE THIS LOAN AGREEMENT MERELY BECAUSE YOU HAVE RECEIVED THESE DISCLOSURES OR HAVE SIGNED A LOAN APPLICATION. REMEMBER, PROPERTY TAXES AND HOMEOWNER’S INSURANCE ARE YOUR RESPONSIBILITY. NOT ALL LENDERS PROVIDE ESCROW SERVICES FOR THESE PAYMENTS. YOU SHOULD ASK YOUR LENDER ABOUT THESE SERVICES. KRS § 360.100(2)(z)2. In the case of a high-cost home loan in which the rate may vary at any time during the term of the loan for any reason other than in accordance with an index, the interest charged on the loan at the maximum rate that may be charged during the term of the loan. KRS § 360.100(3)(c) Any other such subterfuge. The Attorney General, the executive director of the Office of Financial Institutions, or any party to a high-cost home loan may enforce the provisions of this section. Any person seeking damages or penalties under the provisions of this section may recover damages under either this chapter or KRS Chapter 367, but not both. KRS § 360.100(4)(b) The compliance failure was not intentional and resulted from a bona fide error notwithstanding the maintenance of procedures reasonably adopted to avoid such errors, and within sixty (60) days after the discovery of the compliance failure, the borrower is notified of the compliance failure, appropriate restitution is made, and whatever adjustments are necessary are made to the loan to either, at the choice of the borrower, make the high-cost home loan satisfy the requirements of subsection (2) of this section or change the terms of the loan in a manner beneficial to the borrower so that the loan will no longer be considered a high-cost home loan subject to the provisions of this section. Examples of a bona fide error include clerical, calculation, computer malfunction and programming, and printing errors. KRS § 360.100(4)(c) For purposes of this subsection, “appropriate restitution” means the reimbursement by the lender of any points, fees, interest, or other charges made by the lender and received from the borrower necessary to put the borrower in the same position as he or she would have been had the loan, as adjusted in accordance with paragraphs (a) and (b) of this subsection, been originally made in accordance therewith. KRS § 360.100(5) For purposes of this section, any extension of credit shall be deemed to have been made in the Commonwealth of Kentucky, and therefore subject to the provisions of this section, if the lender offers or agrees in Kentucky to lend money to a borrower, who is a resident of Kentucky, on real property located within the Commonwealth of Kentucky, or if such borrower accepts or makes the offer in Kentucky to borrow, regardless of the situs of the contract as specified therein. Any oral or written solicitation or communication to lend originating outside of Kentucky, but forwarded to and received in Kentucky by a borrower who is a resident of Kentucky, shall be deemed to be an offer or agreement to lend in Kentucky and, therefore, subject to this section. Any oral or written solicitation or communication to borrow originating within Kentucky, from a borrower who is a resident of Kentucky, but forwarded to and received by a lender outside of Kentucky, shall be deemed to be an acceptance or offer to borrow in Kentucky. Any oral or written offer, acceptance, solicitation, or communication to lend or borrow, made in Kentucky to, or received in Kentucky from, a borrower who is not a resident of Kentucky, shall be subject to the provisions of this section, applicable federal law, law of the situs of the contract, or law of the residence of the borrower, as the parties may elect. The provisions of this section shall be severable and if any phrase, clause, sentence, or provision is declared to be invalid, the validity of the remainder of this section shall not be affected thereby. KRS § 360.150(1)(d) “Manufactured home financing transaction” shall include both the credit sale of a manufactured home and a direct loan used to finance the purchase of a manufactured home. KRS § 360.150(2) A manufactured home financing transaction may provide for a fixed rate of interest payable in substantially equal successive installments over a fixed term, or may provide that the rate of interest may be adjusted at certain regular intervals. In this latter event, the manufactured home financing transaction shall be subject to the provisions in this section. KRS § 360.150(3)(b) An index approved by the Federal Home Loan Bank Board or by the Office of the Comptroller of the Currency, Department of the Treasury, for adjustable or variable interest rates on residential mortgage loans. KRS § 360.150(4) The rate of interest shall not increase or decrease during the six (6) month period beginning with the date of execution of the financing agreement, and at least six (6) months shall elapse between changes. KRS § 360.150(5) Adjustments, either up or down, to the rate of interest on each adjustment date shall, for the initial adjustment, be equal to the difference between the index value in effect on the first day of the second calendar month preceding the adjustment date and the value in effect on the first day of the month in which the financing agreement is executed. For adjustments after the initial adjustment, adjustments shall be equal to the difference between the index value in effect on the first day of the second month preceding the adjustment date and the index value in effect on the first day of the second month preceding the date of the immediately preceding rate adjustment. KRS § 360.150(6) Where the stated regular interval between rate adjustments is six (6) months, an adjustment to the interest rate may not result in a rate of interest which is more than one (1) percentage point greater or less than the interest rate in effect prior to such adjustment. If the stated regular interval between rate adjustments exceeds six (6) months, then the maximum adjustment either up or down shall be one (1) percentage point multiplied by the number of whole consecutive six (6) month periods in the interval between rate adjustments. KRS § 360.150(7) Any increase in the rate of interest permitted by this section shall be optional with the creditor. Decreases in the rate of interest shall be mandatory whenever the total decrease in the index value equals or exceeds one-quarter (1/4) of one (1) percentage point. KRS § 360.150(8) If the creditor agrees to impose limitations on interest rate changes that are more restrictive than the limitations specified in this section, then such limitations shall apply to both increases and decreases. KRS § 360.150(9) Any changes in the index which are not reflected in a rate adjustment may, by agreement of the parties, be carried over to subsequent rate adjustment periods, and be implemented to the extent not offset by opposite movement in the index. KRS § 360.150(10) By agreement of the parties, adjustments to the rate of interest may result in changes in the amount of regular installment payments due under the financing agreement, or in changes in the term of the financing agreement, or in a combination of such changes in amount and term. Adjustments to the amount of installment payments may be made less frequently than adjustments to the interest rate. KRS § 360.150(11) For all manufactured home financing transactions under this section, the creditor shall comply with all applicable requirements and disclosures pursuant to Part I of the Consumer Protection Act (Truth-In-Lending Act), 15 U.S.C. secs. 1601 et seq., as amended, and as implemented by Regulation Z promulgated by the Board of Governors of the Federal Reserve System. KRS § 360.150(12) The creditor shall send written notification of any rate adjustment, by first class mail, postage prepaid, at least one (1) month before the date that the new rate of interest shall take effect. KRS § 360.150(13) Notwithstanding any of the requirements and limitations set forth by subsections (3) through (12) of this section, the parties may agree on any terms or provisions in the manufactured housing financing agreement as may be authorized or permitted in any program for residential mortgage loans by the Federal Home Loan Bank Board or by the Office of the Comptroller of the Currency, Department of the Treasury, or any other federal department, agency or board. In such event, the creditor shall comply with all applicable limitations, requirements and disclosures of the agency that relate thereto. Penalties.Any person who violates any of the provisions of KRS 360.060 shall be fined not less than ten dollars ($10) nor more than fifty dollars ($50) for each offense.